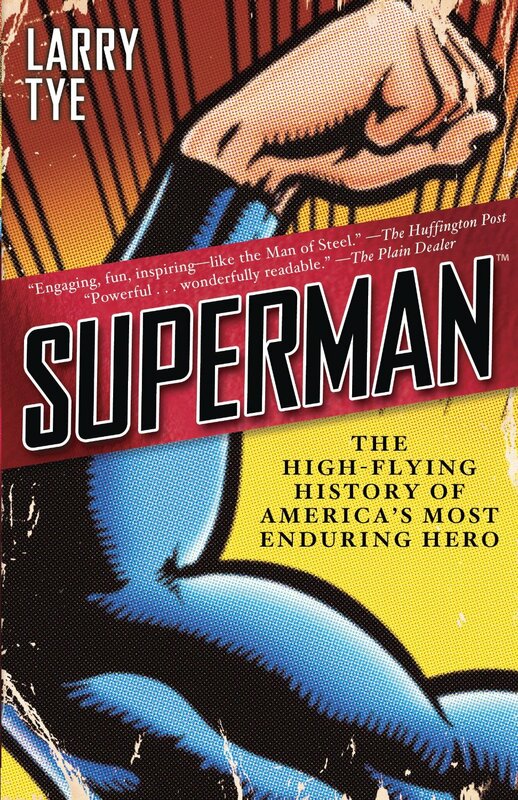 Superman: The High-Flying History of America’s Most Enduring Hero by Larry Tye | 'TAIN'T THE MEAT… IT'S THE HUMANITY! In early 1938 Action Comics no. 1 was published and a new genre of entertainment was born – the comic book had arrived. Although comics, in one shape or another, had been around for over three years it took this comic to cement the industry and create the first superhero and an American icon: Superman. Written and drawn by two Cleveland youngsters, Jerry Siegel and Joe Shuster, the comic was published by National Allied Publications (later DC Comics). Action Comics was an instant success: the first issue sold 130,000 copies and within three years Superman comics would be selling over 1.5 million copies a month. Why the success? The character seemed to resonant with readers unlike any other before him. Maybe it was due to his numerous battles against corrupt officials and slum landlords that hit a cord with both children and adults. Maybe it was because writer Siegel borrowed from already well known characters such as Doc Savage (the Man of Bronze) or Hugh Donner (the Gladiator). Or perhaps it was his status as an orphan from a dead world, making him the ultimate immigrant in a country populated by immigrants. Whatever the reasons he seemed to be the perfect hero for a depression hit America on the brink of war. After the launch of Action Comics things began to move fast. A second title, simply titled Superman, was launched and in 1939 a daily newspaper strip was added to the roster. Off the back of this success Superman merchandising began to appear and infiltrate every corner of American life – everything from Superman toys to Superman bread could be purchased for just a few cents. A hugely successful radio show began in 1940 and ran for eleven years and it seemed as if Superman couldn’t fail at anything he turned his hand too. He was also making National’s owners Harry Donenfeld (a former pornographer) and Jack Liebowitz (a shrewd accountant and self-titled ‘Socialist’) rich men, so much so that Siegel began to rue the contract both he and Shuster had signed giving National the rights to the Man of Steel for a paltry $130. In 1949 the character was so successful that a third monthly title, Superboy, was created to fill out more of the characters back story during his youth. But the late 40’s also saw Jerry Siegel’s frustrations with National Publications increase to such an extent that he convinced Joe Shuster to join him in a legal action against the publisher claiming $5 million dollars in unpaid earnings from merchandising. They settled for $95,000 shared between them and both lost their jobs for their troubles. It would not be the last time the pair took legal action to in regard to their creation. During the next 60 years Superman’s success continued to grow as would the controversy concerning DC’s contract with his creators. Adventures of Superman starring George Reeves triumphed in the fledgling TV market and more monthly comic book titles were added allowing Superman’s girlfriend and best friend to share the spotlight. In the 70’s he battled his Marvel counterpart Spider-Man in the first example of cross company detente. He even fought Muhammad Ali in 1978! He also proved his onscreen versatility by conquering Hollywood with Superman: The Movie and proved it again by returning in an even more popular sequel two years later. Even The Man of Steel’s death in the early 90s made front page headlines around the world when DC killed him off for a few months and the comic in which he ‘died’ sold more than any other in history. Since then there have been more TV shows, more movies, more merchandising, more evidence of his continuing popularity and his ability to span all media. DC even settled with Siegel And Shuster in 1975, providing the pair with a pension for life and adding “Created by Jerry Siegel and Joe Shuster” to every comic featuring the character. Superman: The High-Flying History of America’s Most Enduring Hero, Larry Tye’s upbeat and detailed biography of the character’s history, has been published to coincide with Superman’s 75th anniversary. He covers all the significant milestones in the character’s history and the book is both well researched and very entertaining. Granted, I wish his coverage of Siegal and Shuster’s legal battles with DC were a little less bloodless but for a more meaty, David and Goliath style rendition of the duo’s legal fight I recommended Gerard Jones’ superb Men of Tomorrow: Geeks, Gangsters and the Birth of the Comic Book (2005, Basic Books). Tye’s tone is chatty but informative, perfect for the subject matter. He also delves into why Superman has remained so popular and even discusses whether the first superhero is Jewish. Whatever the many reasons for his popularity it’s clear that Superman successfully tapped into the popular zeitgeist and continues to do so. Random House, 2012, 411 pages.